Wondering what specific Echeverias these are. 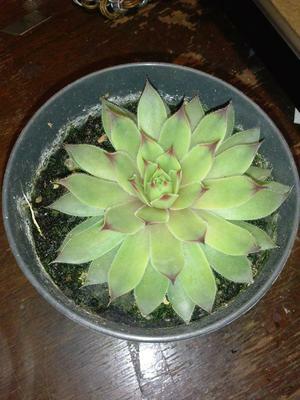 I've been searching through very many online databases to find specific names for each of these Echeverias but as a very un-educated "apartment horticulturist" :P I'm not too sure. The two red tipped ones have different leaves and densities so I feel as though they are different types but can't find specifics online. 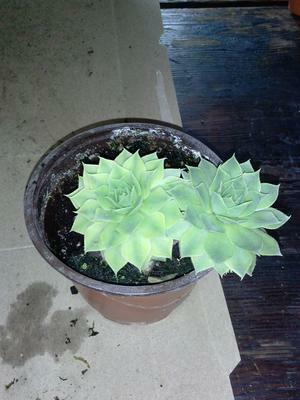 As far as I can tell they are Agavoides hybrids maybe? All are approximately 10cm in diameter. The others seem to match a few possibilities but I can't narrow it down. A bit of educated help would be GREATLY appreciated! I would really like to know EXACTLY what I'm growing and working with. Comments for Wondering what specific Echeverias these are. Hi TJ, I'm sorry I don't recognize any of these, off the top. 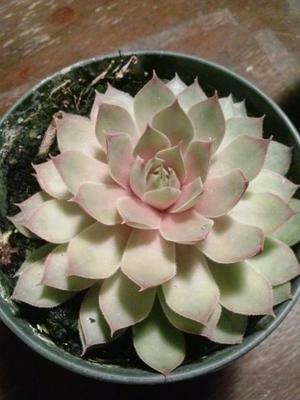 There are just so many different Echeveria, and they also have a unique ability to appear completely different in different conditions. Now that I look more closely at them, I'm even wondering if they are actually Sempervivum. Where did you get them? Is this a possibility? They are extremely hard to tell apart until they bloom, when it becomes obvious, and of course, Sempervivum are cold hardy and Echeveria aren't. One thing I will mention is that yours appear to be not getting enough light, based on their pale appearance. If you can't provide enough natural light, I urge you to get a grow light, which has the added benefit of giving them the correct photoperiod, or length of day that they require (usually 12 hours of day, and 12 of dark). If they are Sempervivum, they won't survive long indoors anyway. I also am a little concerned about the soil, which appears to be getting some moss growing on it - this is especially bad, because moss will only grow on damp soil, which is not what Echeveria can take for very long. 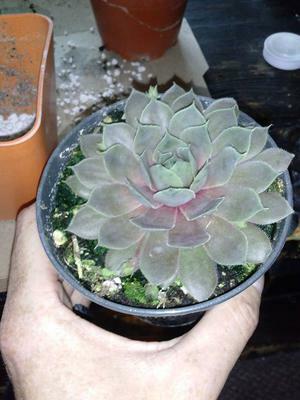 Have a look on the how to grow Echeveria page.